Applications for Telenor Youth Forum 2018 are now open. Are you the next Telenor Youth Forum delegate? Now open for applications, the Telenor Youth Forum (TYF) is a global programme that is designed and hosted by Telenor Group and the Nobel Peace Center (NPC). This joint initiative is based on our shared belief that young people can use digital technology to drive real change in the world and reduce inequalities with innovative solutions. In the last five editions of TYF, Pakistan has produced multiple runner-ups and one winner,Sajawal Waseem, the Pakistani delegate for Telenor Youth Forum 2016 who was part of the winning team at the end of their programme as they showcased their idea ‘Greencred’ to tackle the effects of climate change at Telenor’s first digital exhibition. Applicants between 20-28 years of age in Pakistan are eligible for TYF 2018, which will run in Oslo, Norway, from December 8-11, 2018. Applications will be accepted in Pakistanfrom 1st May to 15thJuly. The TYF program requires a one-year commitment and includes a secondall-expenses-paidgathering in Bangkok in May 2019. Telenor Youth Forum delegates work virtually throughout the TYF year with their assigned teams, averaging around two hours per week. Over the year-long programme, they develop ideas for products, services or campaigns that address urgent social challengesassigned to them at the event’s December kickoff in Oslo. In the six years since TYF began, the programme’salumni have gone on to achieve great things. 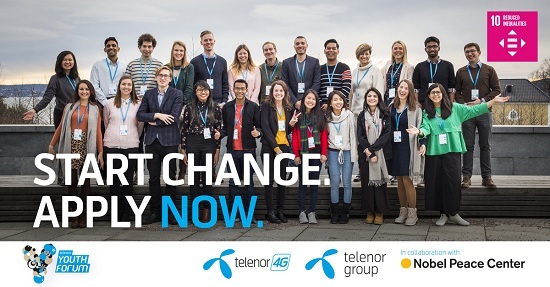 Whether being recognised as part of Forbes’ 30 under 30 issues, winning international humanitarian awards, founding their own NGOs, starting up new businesses, creating new educational platformsor joining the digital innovation teams at Telenor Group, former TYF delegates make a lasting impact. 2017’s TYF delegates are still in the midst of their journey, having kicked off their workthis past December in Oslo where they were placed into teams, assigned challenges and began designing digital solutions. Along the way, the delegates also receive guidance and mentorship from Telenor Group subject matterexperts. Throughout the TYF programme, the mentors equip the delegates with real-world skills such as service design, prototyping, presenting, exhibiting and pitching, in addition to insights on issues that can only be gained through hands-on experience. At the end of each TYF, a winning team is selectedand funds of 100,000 Norwegian Kroner (15,000 USD) are provided through their Telenor mentor as seed funding to make their ideas come to life.